Dr. Robert (Bob) M. Quigley (1934 - 1995). He was the founding director of the GRC and a distinguished Canadian Geotechnical and Geoenvironmental Engineer. Dr. Quigley was a leading figure in Geotechnical Engineering in Canada for over thirty years. He obtained BASc (1955) and MASc (1956) degrees in Geologic Engineering at the U of T and a PhD in Soil Mechanics from MIT in 1961. 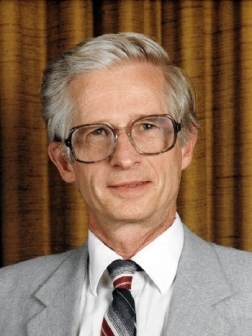 In 1963, he joined Western University as a professor of Geotechnical Engineering. He, together with the late Professor L.G. Soderman, began the geotechnical program at Western and following Professor Soderman's untimely death in 1969, Dr. Quigley took the lead in developing the Geotechnical Group in the Department of Civil Engineering to become one of the strongest in Canada. Dr. Quigley's strengths as a leader included the ability to identify outstanding individuals and provide an environment in which they could develop. He was always ready to listen to and consider the views of others. He provided sound advice and good guidance to many young geotechnical engineers, including his many former graduate students and young faculty members (both at Western and at other universities). He published extensively, authoring or co-authoring more than 100 conference and journal papers and co-authoring a book on Clayey Barrier Systems for Waste Disposal Facilities. He led the multidisciplinary team that identified the role of bacteria in the biochemical alteration of black shale, which had caused the movement (heave) and damage to buildings constructed on black shale in Ottawa. His initiation of studies of landfill sites in the early 1970s, which demonstrated the significiance of the phenomenon of molecular diffusion as the dominant contaminant transport mechanism for contaminant migration from waste disposal facilities through intact clayey soils. His work on the chemical interaction of contaminants on clays gained worldwide recognition. He was one of the founders of the discipline now known as Geoenvironmental Engineering. Excellence in Research Award from the Ontario Ministry of the Environment. Twice being a recipient of the Canadian Geotechnical Society prize for the best paper published in the Canadian Geotechnical Journal (in 1980 and 1993). Legget Award in 1991 (the highest award of the Canadian Geotechnical Society). Canadian Academy of Engineering (1993). Dr. Quigley was a leading proponent of the need for universities to be relevant to industry. As a mechanism for developing these links he was responsible for the formation of the Geotechnical Research Centre. He served as the Director of the Centre from its formation up to his untimely death at the age of 61. Professor Quigley was an outstanding Canadian teacher, researcher, and engineer who had an impact on all those with whom he had dealings.